Popplet: Mind Map or visual platform for ideas. Kind of like a flowchart or diagram. Can you use it in genealogy? YES! It’s great for visual learners, or those who like to “see” their ideas, rather than read them. Popplet is a mind mapping app (presently only iPhone). It is also available online in flash-enabled browsers. Helps you organize ideas and thoughts with visuals. Right up my alley, I thought when I heard about it. But how could it be used with genealogy? Well, Thomas MacEntee did a Legacy webinar on Mind Mapping last November (2013). I was intrigued. Intrigued enough after watching the webinar I signed up for a free account at Popplet. Whoa. Once I started doing my visual thing, I was blown away. Here’s a screen shot of what happened when I worked on just one person! Big box on right has all her names found in records & possible combinations! Can you see the flow of Kit’s life? You can see which events have a record in them. Missing information is easily seen. It was a eureka moment for me — to view her whole life laid out in visual format instead of just words in a database. From this visual flowchart I was able to get a better grip on what I had on Kit, and what was missing. I can’t tell you how good that felt, seeing her life laid out in such a way it made sense to my brain! There are other programs out there: SpiderScribe, MindMeister, MindNode, XMind, MindJet, and Scapple were a few Thomas named off during his webinar. But he recommended Popplet as the easiest interface to use. I love things that take me outside my normal genealogy box. Different ways of looking at my ancestors. New vantage points. Unfamiliar territory. Because it gets my brain out of it’s normal patterns. Did I learn things about Kit? Yes, I certainly did. Did it give me new ideas about where to look for missing information? You betcha. Has it helped me find anything new? Not yet. But I have great hope with enough patience and persistence, her enigmatic time on this earth will be solved. And I also dream of the day I’ll find the final resting places of four of her five little baby girls, who died so young at the very end of the 19th Century. So what about you? Ever doodled your tree on a napkin?! 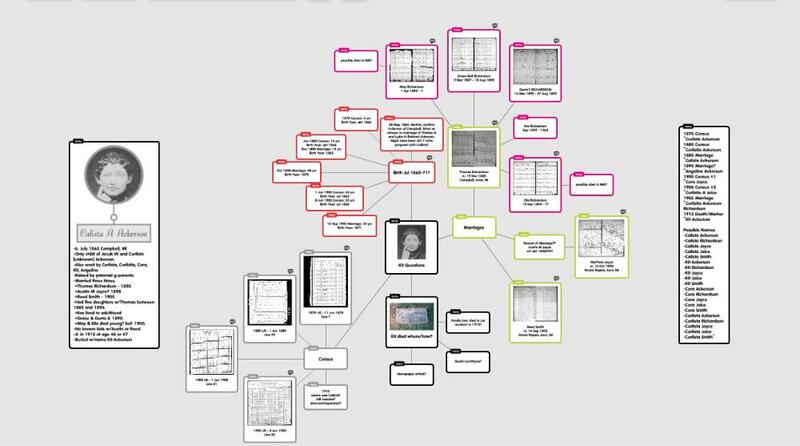 Maybe used a graphics program to flesh out your tree, or questions about your ancestors? Do you think in color, like I do?! Go check out Popplet. It probably isn’t for everybody. Some people are more comfortable in a word environment. And that’s OK. There are plenty of programs out there for them. But if you’re more visual, creative or artistic, why not give it a whirl? When you do, will you let me see YOUR genealogy Popplet?